Hi All !!! I am Jayati. Welcome to my blog! My hobbies are reading books, writing poems, listening music. Read my blog to know more about me ! My 5k trail by Runtastic. I have recently started exercising and gyming. I wanted to take part in 5k sometime and then i read about Automattics’s Worldwide WP 5k. I was not sure if i was prepared for it yet. But then i decided to give it a try today. 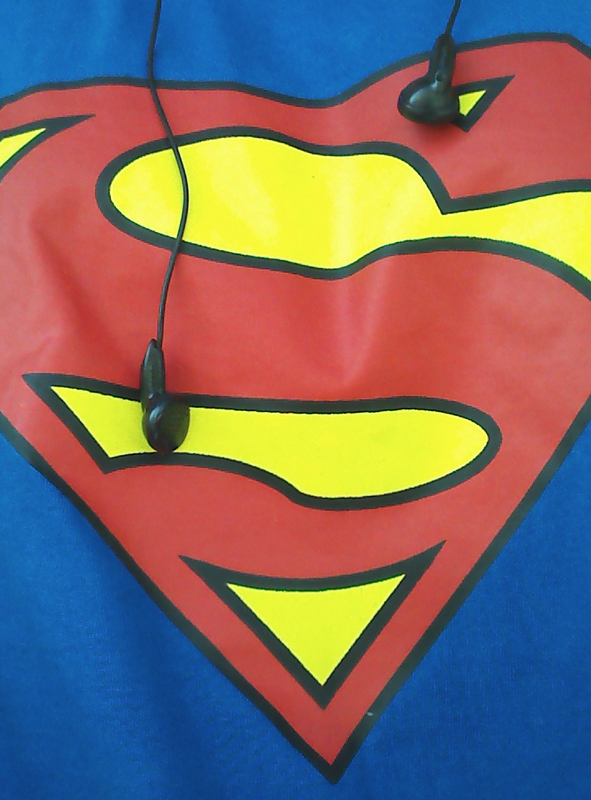 It was a walk+jog. It was fun! All i could think of was WATER! Legs ached but just a few steps more..
And i successfully completed my first 5k! Yay!! I completed my first 5k. It is dedicated to Automattics’s Worldwide WP 5k. I took me less than an hour. I know its not great, but with just 15 days of practice, it’s good enough for me. Looking forward to improve the time further and take part in more 5ks! I am lucky to work in the IT sector, where all i need is a laptop and internet connection and i can easily work from home. However on days when i go to office, I get frustrated when i need to spend hours stuck in traffic. I then spend my commute time thinking of various ways in which traffic can be reduced, so that travelling to and fro to work doesn’t become a nightmare. My craziest idea so far is to own a helicopter for going to work 😀 But then it is turning out to be too expensive. Also if it becomes cost effective, then there would be traffic jams in sky 😀 I could not think of any way so that the current situation can be significantly improved by modifying my city. 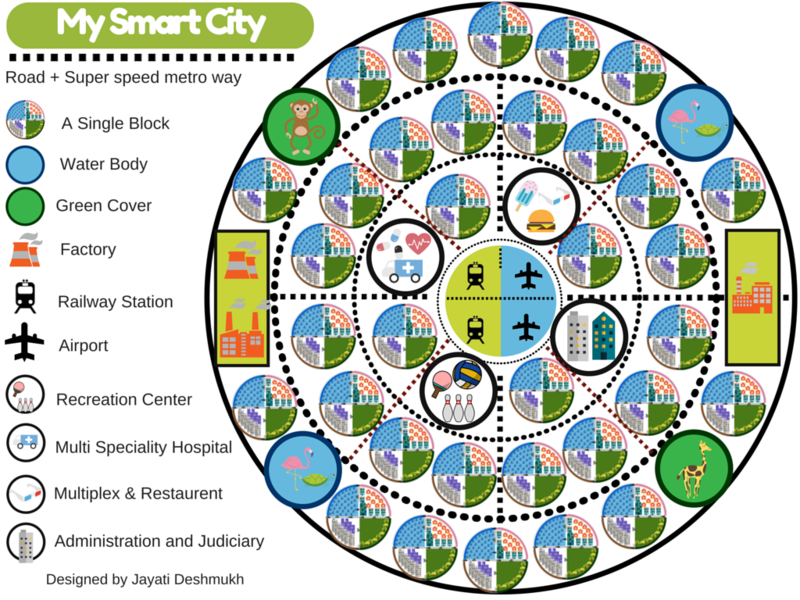 So, i decided to create a plan of my dream smart city. A city, which is clean and healthy, which has lot of open spaces, parks and lawns, lakes, which has easy accessibility to basic necessities and most important of all, clean fast free flowing traffic. After lot of thinking, planning and designing i have finally come up with the plan of the smart city of my dreams. This is my recommended plan if a new city is to be built from scratch which will have its own rules an regulations. This plan of a city is designed considering that most of people work in regular offices (Example- IT Industry). It will need some modifications if the city has a lot of manufacturing industries or import export factories. 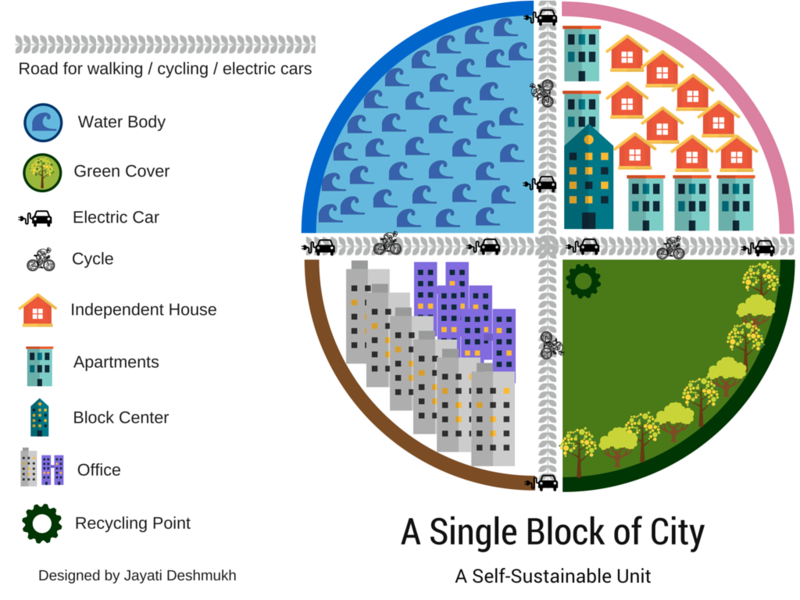 Let us start with a basic building block of the city as shown in figure above. It is a round area divided into four parts. One forth part will have parks, lawns, trees and lots of greenery. Another quarter will be a huge water body like a lake (which can be either natural or man made) with pathways to walk/cycle around. One quarter will have huge multi-storey offices and finally the last quarter will have residential buildings. Residential building will be of all varieties like few independent houses and multi-storey apartments. There will be a block center having a recreation center, a shopping center, a school, a day care, all located within the premises of the block. Complete block will be connected to the high speed internet using WiFi. There will also be a recycling point which will recycle all the waste generated in the block. Ideally each block should recycle its own waste and also generate sufficient energy (mainly from renewable sources) for itself. This will prevent from laying down electricity and sewage lines all over the city. Rain water harvesting can be done in all the blocks. This will increase the ground water level. With the increased water level, these water bodies won’t dry up even in summers. All four quarters will be well connected by roads. Roads will be mostly used for walking or cycling. However there will also be separate lane for electric cars only. Also there will be free transport within a block so that people can easily commute to any point within the block. Its mandatory for people working in the offices to stay in the residential buildings of that block. Also its mandatory to send kids to the school situated within the block. Also just like organizations buy/rent office space these days, here they need to buy complete blocks. People cannot own the houses. They can stay as long as atleast one person in a family works in one of the offices of the block. If people change their jobs then they change their homes as well in the new block where they will work. Overall plan of the city is as shown above. Its planned in a circular manner with multiple independent blocks. I my opinion a circular plan is more effective than regular grid like plan if the best technology is used in all parts of the city. At the core of the city will be the airport and high speed train station which will connect this city to other cities. All the dotted lines in the figure represent multi-lane roads + metro-way. There will be tracks in circles around the city and some straight tracks. The inner most circle will have blocks of highest importance for all. For example as shown in figure some of the inner circle blocks may be like the administrative offices, police stations and judiciary, recreation centers with all the facilities one can dream of, colleges and universities, multi-specialty hospital and so on. There will be multiple concentric circles each having multiple blocks. Organizations can buy/rent blocks as per the number of people they require. Some of the blocks may be museums, huge water bodies or forested areas. On the extreme ends there might be a few factories and industries. There will be high speed metro lines in each of the dotted concentric circles as shown in figure. Also there will be some straight metro lines. At all the intersections there can be metro stations. 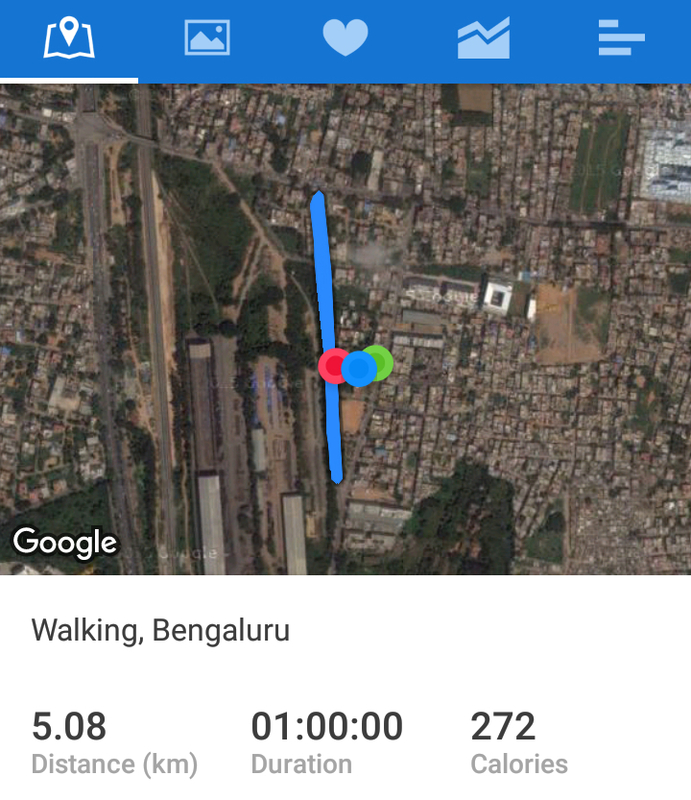 All the blocks will be well connected to their nearby metro station points. Also there will be multi lane roads on the same path. Thus complete city will be well connected. People need not travel long distances to work. In most cases, offices will be in walking distance from residence within a block. Sometimes people might wish to go outside their blocks, and in that case they are connected to all parts of the city by the web of road and metro. Metro will be the preferred mode of transport as compared to independent vehicles. However there will be well spaced charging docks for the electric cars. In the worst case, if every couple works in offices located in different blocks, then one of them needs to travel outside the block. So even in the worst case, atmost 50% of the population will travel outside the block, although its highly unlikely. Even then it should not be a problem due to well connected metro lines, roads and easy last mile connectivity to the blocks. Assume that a person of an inner block needs to travel farthest to a diametrically opposite outer most block. First he can travel to the outer most circle using the nearest straight line and then take the metro of that circle to that block. Most blocks are thus connected in around two hops. In this city, people need not invest and spend huge EMIs for homes and cars. They can spend their money in other areas. After retirement people can either stay with their kids or they can stay in specially designed blocks for retired people. The cities can easily expand by adding more circles. It will require adding another concentric metro and road. And extending the straight roads. Expansion thus won’t hamper the other parts of the city. The best part is that most people will stay close to their offices. It will significantly reduce daily long commute times and also reduce air pollution. Also all the space between the blocks can have huge lawns and forested area. Additionally each block will have its own garden and lakes. This will surely make this city a “blue-green city”. PS – I would like to have your suggestions and feedback about my dream smart city. What changes or modifications do you suggest? What are some of the issues and problems of this city? How can these be resolved. Also i would also love to hear about your dream city. How would you plan your dream city?